Read this, and you'll never look at the Commodore Theatre the same way again. Because you could watch movies here for years without realizing the place holds a veritable "Where's Waldo?" of hidden images and memorabilia. Like a tribute to one of Disney's best-loved classics (the one with seven vertically-challenged miners). Or a painting of the man who ordered the dropping of the first nuclear bomb. Or a working 1940's phone booth. Or a hidden portrait of the Theatre's legendary owner, Fred Schoenfeld. We loved our private tour of the amazing theatre! 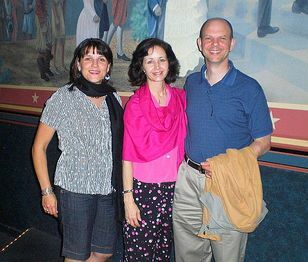 Known as just "Fred" to the Commodore Theatre's faithful patrons, Fred is one of those focused, colorful characters who lives and breathes his passion-- in his case, the movies. Restoring the Commodore Theatre was a labor of love for him, spending literally years of his own sweat and time (and yes, huge amounts of money) to restore what had once been a run-down, unoccupied theater to its original, 1940's glory. But oh, it's been worth it. Guess where the artist of this beautiful mural hid his name? Start with the wall murals which flank the stage. Thanks to Fred's attention to detail, they are similar to the originals from the 1940's. Painted by hand using charcoal pencils and acrylics, then airbrushed on the fabric, they took the artist 18 months to complete! Examine these incredibly-detailed murals up close. 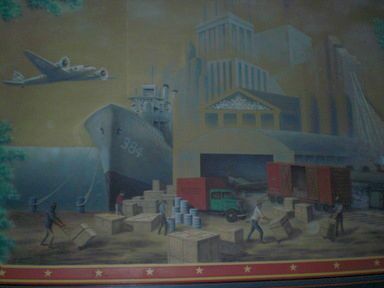 The mural on the left represents Hampton Roads industries, including shipping, ship-building, and the military. Look carefully: The artist hid his own name on the side of one of the vehicles. And two of the ship-yard workers are actually likenesses of guys who helped Fred during the restoration process. 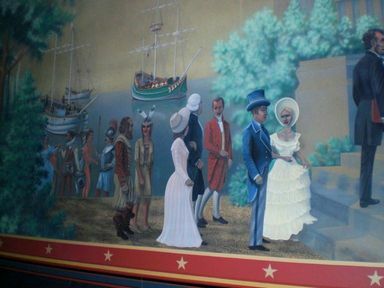 The mural on the other wall--which represents the history of the United States and famous Virginians-- is even more detailed. Keep an eye out for Pocahontas chatting with Captain John Smith, George and Martha Washington out for a stroll, and a determined Abraham Lincoln striding up some steps. 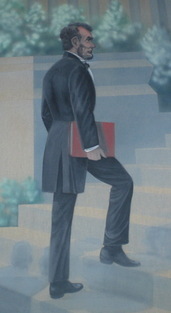 A close-up of Abraham Lincoln. Look really carefully just below the exit sign in this mural and you'll see a six-inch immortalization of another famous American president: Harry Truman. In keeping with a lifetime spent being the man behind the scene, Fred declined to let me take his photo. But you can still see him in the form of the man in the blue suit and top hat in this mural. 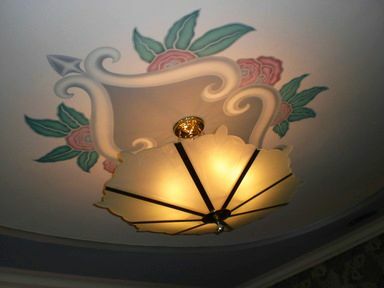 Even the ceilings are beautifully-detailed. There was one stop on our tour I simply can't do justice to: The projection room. Frankly, it was rather over my "non-technie" head (literally). Here's the part that floored me: Movies are still delivered to theaters and shown on those huge reel-to-reel machines. Yeah-- you know, those old-fashioned ones using film? Go figure. I just figured they popped in high quality DVDs and somehow projected them onto a screen. Educated as an electrical engineer, Fred was trained by people who cut their teeth during the Silent Era of film-making. And he was personally trained by "Star Wars" and "THX" creator George Lucas. 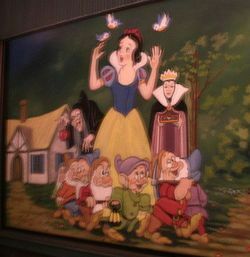 My poor camera doesn't do justice to this hand-painted tribute to Walt Disney's Snow White in the lobby. So he truly knows his stuff, inside and out. And that's why seeing a movie at the theatre is more than just a matter of glitz. It's the probably the best movie viewing experience you'll ever have. That's because when you go to the Commodore Theatre, you're in the hands of a master. On a side note: If you have time to kill before your dinner and movie, take a stroll through the Trinity Episcopal Church courtyards, located next door to the Commodore. It's a lovely little garden with a variety of gravestones, many dating to the Revolutionary War.